£24.99 + £3.99 P&P FOR UK MAINLAND. You can buy Jask now using our secure online paypal system. We make every effort to deliver accepted orders within 2 days by the following day by courier (excluding weekends). Delivery is via a signed for courier service. We can process orders for outside UK mainland, please contact us by email or phone for relevant rates. £9.99 + £3.99 P&P FOR UK MAINLAND. You can buy Travel Jask now using our secure online paypal system. We make every effort to deliver accepted orders within 2 days by the following day by courier (excluding weekends). Delivery is via a signed for courier service. £12.99 + £3.99 P&P FOR UK MAINLAND. 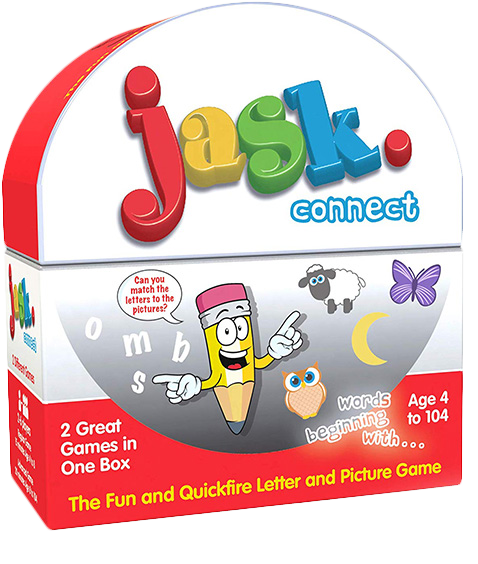 Jask Connect has two brilliant and unique games in one box, both games encompass quick-fire fun, teach the ages 4+ the alphabet, and later in life for the 8+ the art of spelling indeed it is a superb fun medium to entertain and amuse teenagers and adults alike. 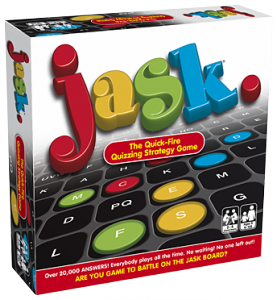 You can buy Jask Connect now using our secure online paypal system. We make every effort to deliver accepted orders within 2 days by the following day by courier (excluding weekends). Delivery is via a signed for courier service.